Mask Surf Pro is excellent privacy software that can help you to surf the web inside a entire safe and secure way. With this software you will be able to surf the web anonymously by hiding your IP address, by doing this you can make sure that your information stays intact. Also Mask Surf pro removes all traces from internet activity, like temporary files, cookies, cache, website history and more. Mask Surf Professional is a straightforward to use anonymizer with different highly complicated technology called Tor. Tor is an open project targeted at providing the highest level of security for online surfers that is pioneered by some of the greatest network professionals. Mask Surf Professional creates good use from the array of encrypted Tor tunnels and distributed servers while offering a degree of protection you’ve never thought. The professional edition of the application is geared for advanced users that require with additional control and flexibility than regular surfers. It features an ability to select the nation that the software will use to emulate the user’s location, that makes it possible to bypass geo-specific browsing or accessibility restrictions. Users may also specify alternate anonymity tests to be used through the application and switch together to make sure that no real Ip has been recorded through the visited resources. 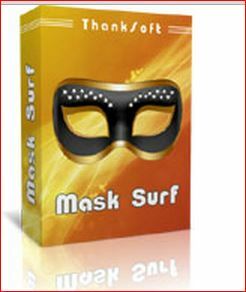 Mask Surf Pro is going to be a perfect solution for skilled users who need the functionality from the standard edition and yet would like to become more flexible in terms of controlling particular aspects of their online activities.This is a freeware and can be downloaded from its official website or any other third party websites but be carefull when downloading softwares from third party websites because they can have keyloggers and trojans behind them. You can find soo many videos in youtube and its official site to use in in effective manner .This tool is one of the excellent handy lightweight while testing for vulnerabilities without getting trouble with our Ip address goes into blacklist.